The U.S. Marine Corps has designated a group of 10 Lockheed Martin-built F-35B fighter jets for initial operational capability to become the first military service branch to declare the plane ready for worldwide deployment. “(Marine Fighter Attack Squadron 121) has ten aircraft in the Block 2B configuration with the requisite performance envelope and weapons clearances, to include the training, sustainment capabilities, and infrastructure to deploy to an austere site or a ship,” Marine Commandant Gen. Joseph Dunford said Friday. 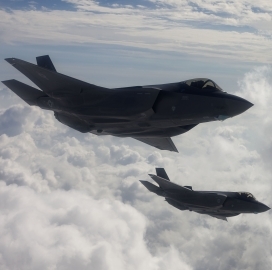 Reuters first reported the Marine Corps’ decision to give the F-35B the IOC status and said the branch plans to buy 420 of the B-model and C-model jets. Andrea Shalal writes the Marine Corps will be the first service branch to declare IOC for the $391 billion program and plans to deploy the first operational unit of the fighter jets to Iwakuni, Japan by 2017. The planned declaration could pave the way for the utilization of the initial F-35B squadron for crisis response efforts worldwide, Shalal reports.